Here are a few pictures of Camber. I’ve been trying to capture the perfect pictures, but the camera just doesn’t do him justice. The contrast between his base coat and his spots is so much more dramatic in person. He still isn’t showing any sign of growing into his feet. With his body becoming long, lean, and leggy, they look even bigger in comparison. 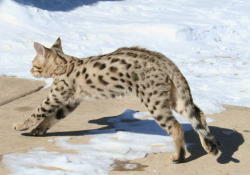 Next, to Savannah’s they are quite a bit bigger, especially the back feet. Aside from the fact that he was nearly double the size of his litter mates, his most impressive feature is definitely his personality. He shows no apprehension towards strangers or unfamiliar places. He greets everyone with curiosity. He is also very demanding when it comes to wanting attention. His favorite methods of getting it are to blast between your feet while you’re walking, climb your legs, or pounce on you from behind and cling to your mid-section. He has also learned to use the dog’s bell that hangs at the back door. 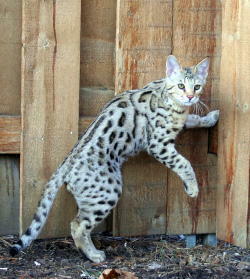 When Hershey and Savannah are outside, he will whack the bell until they come in or he is let out to join them. Every morning starts out by him chasing me around the pool table for awhile. Then, I’ll “let” him corner me so he can move in for the “kill”. 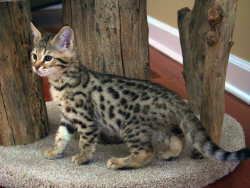 He arches his back up, puffs up his tail, flattens those big ears against his head, and pounces. He will do this until his tongue is hanging out and you can hear him panting. Once I head to the shower he will sit in the bathroom and make loud chirping-like meows. It’s only been 2 weeks since the last update, but he has grown so much in that short time. He is now tipping the scale at 7 lbs 4 oz at only 14 weeks of age. Also, I’m going to have to recalculate the next food order as he is consuming nearly ¾ pound of raw and a few ounces of dry per day. Every couple of days it seems he discovers a new ability. Not content to simply chase toys around on the floor anymore, his new favorite game is to leap into the air and grab his feather teaser in flight. Apparently the move is more fun when an aerial maneuver, such as a back flip or a front roll, can be incorporated. He has also demonstrated an uncanny ability for observational learning. 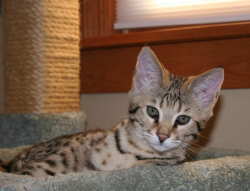 During my visits to pick out a kitten, one of the things that were immediately apparent about him was how aware he was of activity in the room compared to his littermates. 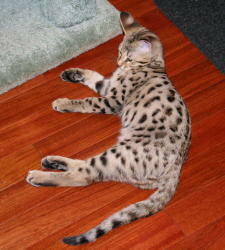 Upon arriving home he appeared to study every behavior of our F5, Savannah and our 20 lb miniature pincher, Hershey. One of the first behaviors he learned from Hershey was to ring the “dog bell” to go outside. Now, rather than using his litter boxes, he will wait and join Hershey in using the outdoor facilities followed by the “drag race” back inside and across the kitchen to Hershey’s food bowl for a treat. But, since he doesn’t eat treats we are assuming he races the dog because “that’s just the way it’s done”. His personality continues to be his best feature. To me, the term “lap cat” conjures up images of a calm cat with an easy-going personality, and Camber is far from that. But, when he finally tires of playing, your lap is where he wants to relax. Camber is now 4 months old and he weights 9# 3oz. He is so long and lean that I’ve also begun to measure from chest to rump, which is at 16”. To look at him you would think he is a full grown cat…until he meows and exposes his little baby teeth. Always looking for predictors of future size, I’ve been graphing his growth rate and his food consumption. Noticing a decrease in his food consumption, a few weeks ago I decided to supplement his diet with raw food. WOW! Does he enjoy eating now, but not only the new food. His appetite has been stimulated to the point where he even devours plain dry food. 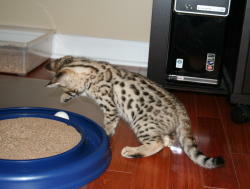 Play time is also evolving as he grows and as I come up with ways to stimulate his Serval instincts. Once content to chase his teaser around on the floor he quickly became bored with that, preferring to chase it through the air and leap after it. Well, for a cat that demands ever increasing levels of stimuli, the next step was obvious. Since bird-watching every morning at dawn gets him very excited, I got the idea to tie a feathered, stuffed cat toy to a fishing pole. The fishing pole allows me to cast the toy about 60’ across the backyard, driving Camber absolutely crazy with excitement. 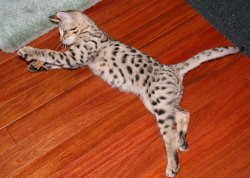 He will leap about 4’ high and cover about 10-12’ of ground to grab the toy out of the air, just like you read about regarding Serval hunting behavior. 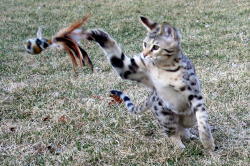 Our F5 enjoys this game as well but she prefers to stalk it as I reel it in across the ground. The difference in their intensity is amazing. Everything Camber does he does with more leaping, more force, and without regard to consequences- like crashing into everything.